Home » Blog » Left-handers in Martial Arts | Advantage or Disadvantage? I have never considered it though I feel that they must have quite an advantage. In my experience it makes the fight more challanging and interesting. I find that your opponant (if in the south paw stance) is open to more of your attacks but in the same way you are also open to the same with your stances mirroring each others. so its a wash, it just makes it more difficult to get your hits in AND not get hit too. especially since your own experience against left handers may be limited yet his or her expeirience against right handers will probably be 10:1 to yours for lefties. interesting topic – does anyone have any techniques they use against a south paw? or does any lefties have a killer technique against righties? So pleased to see you here Zoltan, your insights are always thought-provoking. Yes, it definitely opens up the game when you are against a lefty. 10:1 ratio is about spot on with 90 percent of the population right-handed, so only about one in ten fighters are not much to practice with. Luckily I am left-handed so all my students can practice on me! Your question is a good one about the best techniques for lefties and righties Zoltan. Without giving my secrets away, hahaha, I will say it is a widely accepted fact in boxing circles that as a lefty you must constantly move to your opponents left, to create difficult angles of attack for them and to open up your own angles. The right-hander must resist this (the best ones always do). Regarding strikes, the lefty is almost always open to a right cross or overhand straight down the middle. The lefty will pepper you with jabs and this will be very hard to stop. And if he gets the angle, watch out for the left cross, it will come out of nowhere. These are all worth workshopping, especially when the kicks come into play, and then throw in takedowns and grappling and the game becomes even more complicated. By the way, almost all wrestlers prefer the “lefty stance” because it keeps their strong arm and leg in front. Thanks for commenting Zoltan. It was interesting for me to learn that Joe Frazier was a converted south-paw. That explained his viscous left hook! Welcome here Dr. J! Enjoyed your blog a lot. I did not know that about Frazier, no wonder he gave Ali fits. That hook put many a heavyweight to sleep. The bottom line is that you can become a great fighter no matter what foot or hand leads. However, if you do decide to make the switch to southpaw make sure you have trainers who are comfortable with a left-handed fighter. Also, dedicate yourself to developing your weaker hand. Constantly spar with orthodox fighters while you maintain a southpaw stance. Practice your foot movement and constantly circle to your right. Watch and study fights between right-handed and left-handed combatants. Most important, make sure you’re confident of your skills as a southpaw fighter before you book a bout. Points well made cataract eye drops. Thanks for visiting. 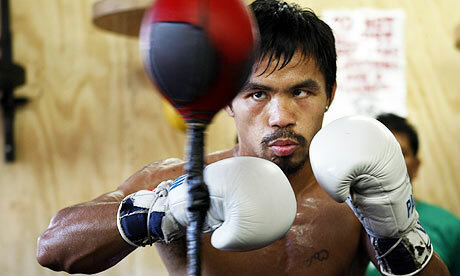 I like to watch Pac Man in action against right-handers, it is textbook perfect.